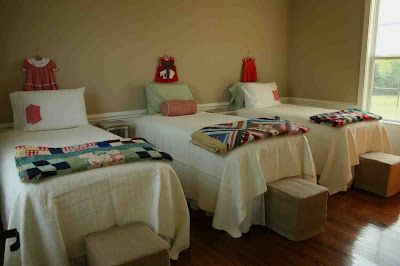 NOTE: This post shows the room the way it was soon after we moved into the farm. For a more updated view of this room, you can click HERE. This is an EASY project, no paint, no sewing, no glue. Well, I tried to just talk about the project, but it always reminds me of a story. Feel free to skip below to the project, if you are in a hurry. Our girls’ room at Cedar Hill has three beds in it, two for our girls and one for a guest. 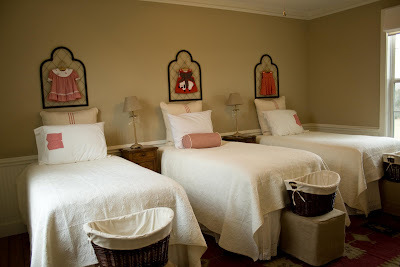 And now that they are teenagers, I feel the need to clarify a policy that has always been in place, but had not been specifically enunciated before; ANY guest that stays in the guest bed MUST be female. Okay, I feel better now. Not that it has come up yet, but some things are better to head off at the pass, if you know what I mean. I told them that if they followed the rules, I would be happy, and that as long as I was happy, they would be happy, but if I became unhappy, then they might experience a profound sadness, the kind of sadness that might occur when, I don’t know, maybe your parents have been called to come get you at 2:00 am because you were misbehaving. Later, when I went upstairs to check on everyone, several of the girls suddenly had developed a deep home-sickness and were longing desperately to be with their parents (WHAT?) so badly that they HAD to leave immediately. Most of the girls left that night, even though it was a sleep-over, which left my daughter in tears. In fact the only girls that stayed were the ones, whose mothers refused to come get them. They wanted to get out of Dodge, before the mean mommy found out that her furniture had been destroyed. I didn’t find out until the next morning, but I digress. What were we talking about? The dresses! I wanted some artwork to place above each bed, especially since we had no headboards for the beds. I looked for framed prints, but just couldn’t find a set of three that I liked. Besides, I wanted something unique and personal. Although traditional framed artwork can be pretty, but is sometimes pretty boring. Long ago, when my daughters outgrew their baby clothes, I kept this set of red dresses (actually it is a set of 5) hoping I would have some way to display them later, and here was my opportunity. Notice that the baby clothes had a common theme, in this case they are all red. I don’t think these dresses would have a unified look if they were all different colors. I wondered how it would look if I hung a dress above each bed. “Hmmm, it’s missing something,” I thought. I needed something that would act as a frame for each dress. I looked around for a long time to find just the right accent, until I came upon these metalwork pieces. I found these in a catalog, and The Market St. Shop special-ordered these for me. They are actually designed to hold cards or photos. 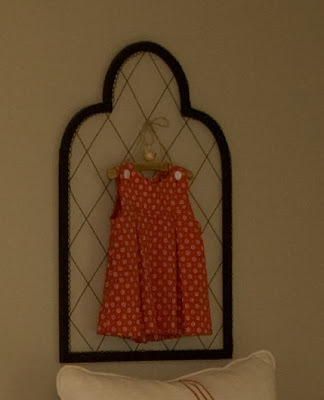 I hung the dresses on some cute wooden hangers from The Container Store. You can see what the hangers look like below. 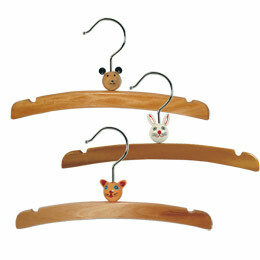 I then attached the hangers by tying them on the metal frames with twine. I think that was a easy way to attach them that fit with my relaxed, country theme. Here are some pictures to show you some of the details on the dresses. The hardest thing I did was measure the room so that the dresses (and beds) would be equally spaced across the room. Once I determined where each frame would go, I placed it evenly over each bed and up high enough to slightly clear the euro pillows on each bed. 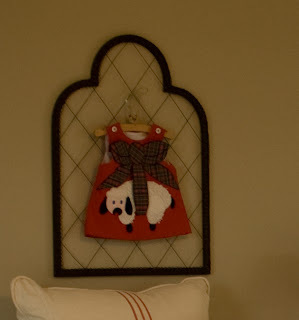 Since these metal pieces and the dresses were not heavy, I just used regular hanging hardware for each piece. I wish every project was that easy. 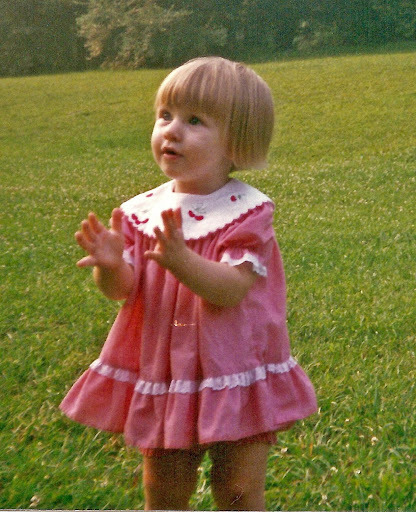 And here are a few pictures of my girls actually wearing the dresses (long ago) that I threw in, just for fun. Such a sweet idea! Looks great. I love that you added the pics of the girls at the end. 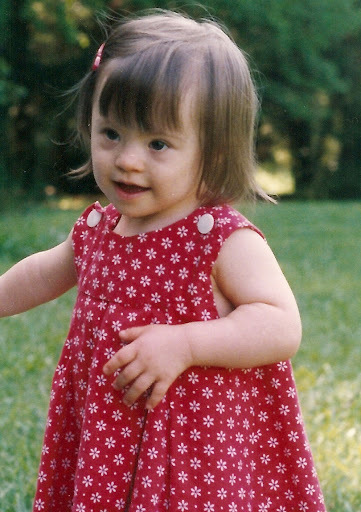 So precious. What an awesome idea! 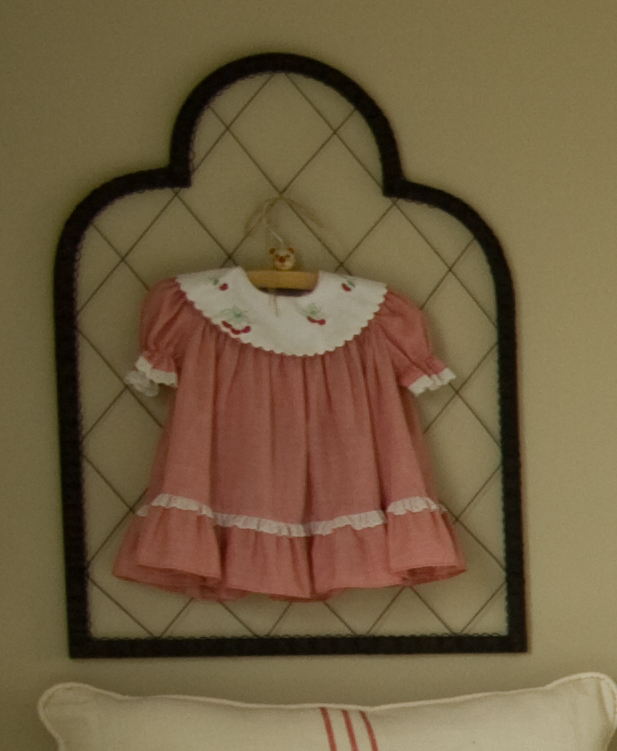 I am always looking for ways to a) use things from when Babydoll was small and b) decorate in a unique manner. Super job! Thank you so much Nadya. I appreciate your sweet words. 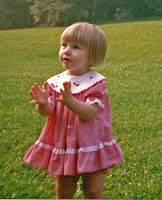 The dresses are darling-what a wonderful way to remember their little girlhood. And the way you displayed them is perfect, so original! Thank you for sharing the settee episode, at least that way I am forewarned of what is to come. Maybe I will corral the teens in the basement (ahhh…that means I will have to look for a place with a basement).